Matt Noakes has dominated Round Four of the 2018/2019 Cranecorp WA Modified Sedan Series held at the Trade Hire Augusta Margaret River Speedway on Saturday night. Noakes who grew up racing at the Margaret River venue dominated the nights racing winning two of his three heat races before winning both the Southern Stump & Mulching Services Shootout and Feature Race. Fifteen Modified Sedans were on hand for the Modified Sedans first visit to the region for two years with Kevin Ellements return to racing only last one lap after suffering heavy damage to his Holden Commodore after an accident. Brett Mills and Shane Dubberlin were both out for the night after the first round of racing leaving the final two round of heat races with depleted fields. 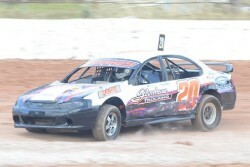 Current Western Australian Modified Sedan Champion Anthony King won two heat races during the night but was forced to watch the feature race from the sidelines due to severely hurting the powerplant in his Totally Independent Tyre Service Ford Falcon. Both Adam Houston and Matt Kata were also unable to start the main event due to mechanical issues with their Ford Falcons suffered during the final round of heat racing. Nine Cars faced the starter in the feature race which was reduced to fifteen laps with Matt Noakes leading Nathan Penn and Rick Musarra in the early laps before the only stoppage of the race occurred when Musarra made contact with the lap car of Melissa Bust. Bust would be sidelined with damage to her Mazda RX-7 with Musarra sent to the rear of the field with Nathan Penn also relegated two positions during the stoppage. Jayden McCuish found himself in second place with Branden Fraser, Nathan Penn and Narrogins Paul Stevens trying everything to find a way past him after the restart. Musarra retired from the race on lap nine with Penn finding a way past McCuish to move into second as the leader Matt Noakes enjoyed a healthy gap back to the rest of the field. Matt Noakes would go on to record his second round win of the season with Nathan Penn crossing the line in second place before being relegated for the second time in the race for contact when passing McCuish. Jayden McCuish would be officially second with Branden Fraser elevated into third place ahead of Nathan Penn with Paul Stevens, Allan Mortimer and Merv Penn rounding out the finishers. Round Five of the 2018/2019 Cranecorp WA Modified Sedan Series will be held at the Attwell Park Speedway in Albany on Saturday, 9 March 2019.